I love the song. Well, I love cats in nearly every kind of context. Sorry to have brought up the "nyan" subject, I knew it would cause uncomfortable memories to some people. In the Higurashi opening, is it a cat mask Rika is wearing? I always thought so because she is obviously very close to cats in personality and behaviour, and she also makes cat-like noises. But I also read someone's statement who thinks it's a fox mask. So what is right? I think it's hard to tell just from the features of the mask but I think it could really be a fox. But if that's true, this would be the only appearance of a fox in the whole story, wouldn't it? 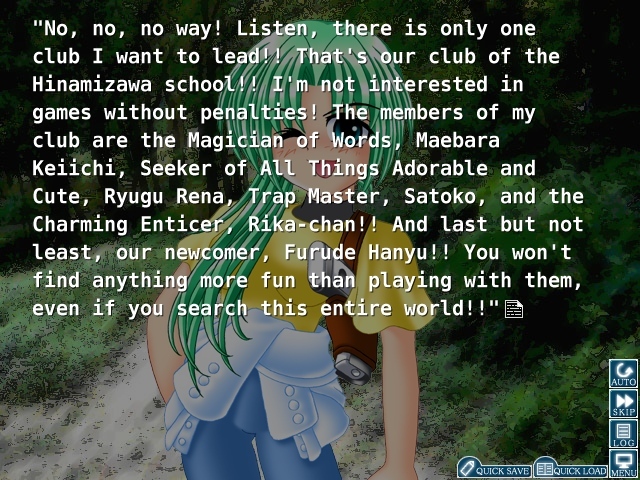 Well, maybe someone might say Rika is as sly as a fox or something like that, but I'm not really sure if there is a line like this anywhere in Higurashi. It's definitely a fox mask. I think the mask is there because it symbolizes that she's hiding the real her. Also the fox is popular in Japanese mythology. I'm certain you're right about that. So do you think it's a cat or a fox? To be honest, I wrote a poem about Rika (in German, so I don't know if I should post it here) in which I mention her "cat mask". So I would like to know if this is a mistake because maybe I should rewrite it in that case. It's a kitsune/fox mask. There is also a cat mask in real life, but her mask most closely resembles the Japanese kitsune masks. Rika is not only associated with a cat, fox... but if I also recall correctly, her title is the tanuki of the game club. Thanks, this is really interesting. Are the other club members also related to animals in a similar way? I can't recall anything about this right now. No. Satoko is the "Trap Master" and Keiichi is the "Magician of Words". Can't remember Mion and Rena's titles, though. I can only remember the confrontation scene in Matsuribayashi, when Mion introduces the members to Okonogi. I think she says something about Rena's "adorable"/"I want to take it home" mode while Mion does not call herself a title because she's the one who's speaking, and (even for Mion) it would be too arrogant to give herself a title of honor. Rena is also related to as the "silent blue flame" while Keiichi is the "bright red flame". That's all I can remember as far as club titles are concerned. Well she refered to as the leader and she refers herself as 'an old man' in drama cds due to her humor as well as being the oldest of the bunch. She calls herself an "old man" in the visual novels too, which kinda ties in with her "Uncle Mion" nickname. What's Mion's "old man" in Japanese? Does she call herself "Mion-ojisan"? I can't remember right now. I think I remember now what Rena's title is: "Collector of adorable things". Yeah, Mion calls calls herself 'oji-san' or 'Mion-oji-san'. I have another question about the end of the dam conflict. The minister's grandson is abducted in June 1978. Then the decision was made to cancel the project. But the dismembering murder takes place in June 1979, so the construction workers are still there one year later. So did they really work one more year after the projekt was cancelled? Yup. They were still there one year after the construction was stopped. I don't know why, though. Maybe they had already started building the dam and so had to, uh, "un-build" it or something? Or they just had a few things they had to sort out there or something… Who knows. maybe it was just bureaucracy and it took that long from the decision being taken to the construction being stopped. Thanks to both of you. I already thought about something like this, but I also thought I could have missed something. In the Hinamizawa Disaster, the Yamainu and the Self Defense Force are involved. But I ask myself which of both forces does what. Does the Self Defense Force enter the scene when all the villagers are dead and believe there really has been an outbreak of volcanic gas? Or is the SDF involved in killing the villagers? Because in Tatarigoroshi-hen and Yakusamashi-hen the survivors Keiichi and Satoko are saved and not killed by the SDF. Found this while searching for Rena's nata on google. Anywhere I can get one of those (Echizen or Haku hatchet, or other similar blade to the "Rena Ryuguu Special", if not an exact copy) in the US, preferably without specially ordering it? For that matter, is there anywhere that sells anime replica weapons that go beyond the usual mainstream crap. Hey, the "previews" at the end of the anime episodes... are they supposed to be Bernkastel's poems as well? Without love this picture cannot be seen.